Virginia Sánchez Rivero is a dedicated, hard-working teacher who has been teaching at the school Julio Quispe in the community 27 de Mayo for the past six years. Prior to her participation in the Healthy School Project, Virginia said she never received any training on combining basic academics with health and hygiene. She always focused on core classes and never gave much concern to teaching students how to form better hygiene habits and lead healthier life styles. And never before has she been able to maintain a hygiene corner in her classroom. Virginia is thrilled to receive training through the Healthy School Project and the efforts of Etta Projects. What’s more, the students are excited about the new hygiene corner filled with toothbrushes, toothpaste, soap, nail clippers, towels, and cleaning supplies. Virginia now implements daily activities such as beginning each morning by washing hands and brushing teeth, and ending each day by cleaning the classroom and tending to the school garden. She also tries to promote health and hygiene in different lessons throughout the core classes. Virginian adds that she has noticed how the impact of the hygiene activities is already making its way into the community as students repeat the same activities in their homes. 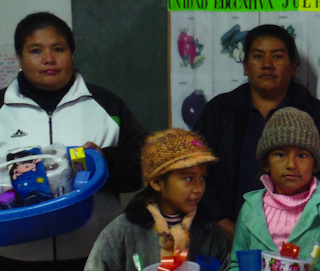 Thank you, Peter and Melisa, for helping to make the school Julio Quispe a better, healthier place to learn through Gus and Elena’s STP campaign!! !